Windows Vista users can easily change the amount of local disk space limit that Volume Shadow Copy and System Restore can used to create restore points on the system which backup files and folders for recovery by using VSSadmin. However, the process involves usage of Command Prompt shell and manual typing of commands, which some users may not be comfortable with. Here’s an alternative way to change and set a new limit to the size of hard disk space that Shadow Copy related services can used. 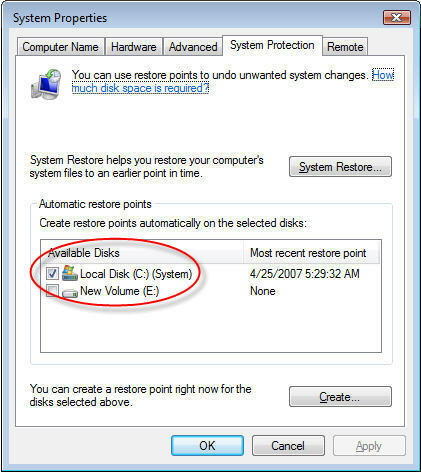 The trick is to disable System Restore automatic restore points creation and then enable it again. The trick makes use of the fact that Windows Vista will always set the upper bound of the space for System Restore (and Shadow Copy) to equal to 30% of the remaining space on the volume or disk partition. By disabling and enabling System Restore, we can easily reset the limit to make it bigger or smaller. When your space usage grows and free space is limited, the trick will reduce and shrink the space System Restore use, and thus release and allocate more space to users. On the other hand, if system free space grows, Windows Vista will recalculates the space available, and set 30% of it as the new limit, and thus increase or expand the allocation to System Restore. Note that the only downsize to this hack is that you will lose all previous restore points, which is exactly backups of files that has been saved. This including files that used to restore in Previous Versions and System Restore. Click on Start button, then select Control Panel. Next click on System link (You may need to select System and Maintenance first). In the Tasks pane on the left, click System Protection link. A System Properties dialog box will popped up with the System Protection tab selected. There should be a tick on at least one or more available disks. Clear or untick the check box to the left of the drive letter that you want to reset the space limit for VSS. When prompted with “Are you sure want to turn System Restore off” warning dialog box, click on Turn System Restore Off button, and then click Apply. After disabled System Restore, now we want to enable and turn if on again. Click and tick the checkbox to the left of the drive letter, and then click Apply button. 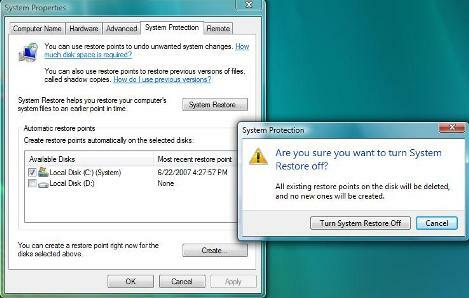 Manually create a restore point by click on Create… button located at the bottom of System Protection tab. Windows Vista will now calculate the remaining space available and set the new System Restore space limit to be 30% of it. You can verify the new limit and amount of stored in use by using VSSadmin in command prompt. Note that the smallest the limit will go is 15% of the total drive or volume disk space. If the 30% of the free space fall below this value, 15% of the total disk space will become the bound and set as Volume Shadow Copy (VSS), System Restore and Previous Versions disk usage limit.